I ran out of paint after the first coat. 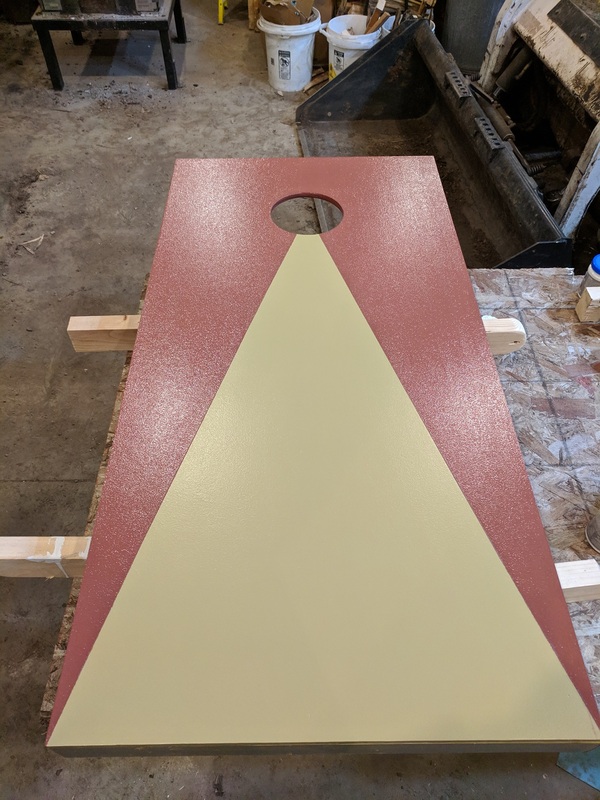 I had the paint custom made to match a specific color. I still had the numbers/code so I thought it would be easy to match. The sample the store put on top of the can sure looked like it would match, however after the paint dried it wasn't close to the sample on the can. I was expecting a burgundy, but instead it dried a pinkish color. I double/triple checked that the numbers on the new can does indeed match the colors on the old can. The sample they put on top of the can does look correct, so I do not think that the store mixed the paint incorrectly. The paint is Sherwin Williams Satin, Deep Base from Lowes. 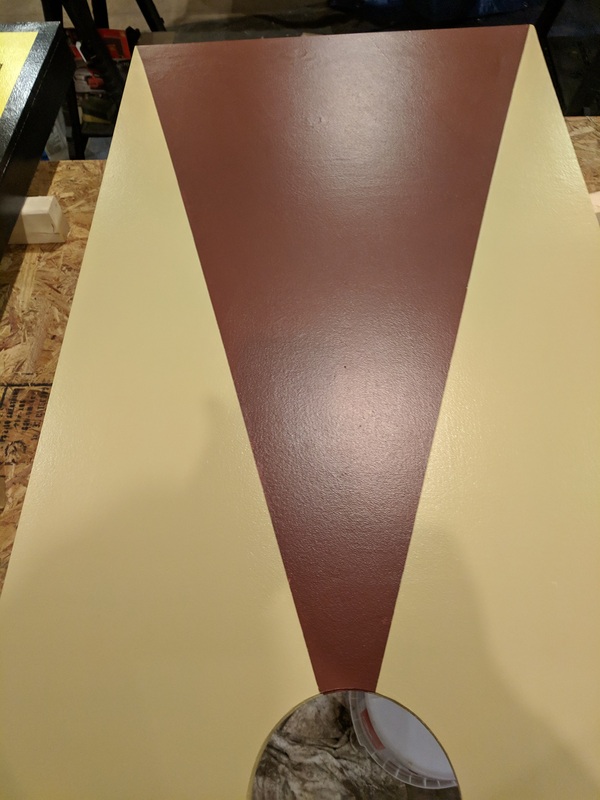 What can I do differently to help make the paint match better when I repaint next time? Unfortunately I did not take a picture when it was completely dry. However it did not change much in color. Take the two empty cans back to the store and ask them for a refund or replacement. Most big box stores offer satisfaction guarantees and will replace mismatched paint; the policy is designed for situations like what you're describing. Buy the whole quantity you'll need right up front, versus buying two cans in separate transactions. The codes are nice, and they're usually pretty close. But, especially at the retail level, it's not an exact science. There can be variations even between buckets in the same purchase. When you buy paint, make sure to get enough for the entire job in one go. Make sure it's all the same base. I tend to go to dedicated paint stores rather then Lowes or Home Depot for significant jobs. That's where the pros go for a reason. They have better equipment & training and - in my experience - do a better job. Mix well, scraping off the bottom - particularly if it's set awhile since the store shook it. Get one of those drill operated paddles. Start the job by using those extra buckets to mix all of your buckets of paint together and stirring thoroughly. This ensures that you'll have a consistent color for the entire job. I've definitely noticed differences in tint when pouring buckets together in this step. Back to your situation. I think your only solution is to get another batch of paint and re-paint both pieces. First, the human eye can distinguish millions of colors when they're laid right next to each other. However, in terms of seeing colors separately and trying to remember their matches, we are positively hopeless. Further, even small changes in light cause significant changes in perceived color even if you had a color sampling device, so cameras are as blind as we are. The Smithsonian recently restored a Jim Crow era passenger coach. Naturally, their color research was pristine. However, having nailed the right color, they then altered the color to correct for the flaws in the fluorescent or whatever lighting in their display hall. Except the lighting industry was innovating like crazy, and three years later, you could buy true-daylight lights at Lowes. But now, that would make the color wrong, eh? So they are stuck using their 1970s tier lighting. I am not Smithsonian tier, but I usually nail it. But even with my book of 1700 color chips, careful matching with photos and Photoshop analysis, I've ordered a $300 gallon of paint and had it not match the exemplar. This was burgundy, and my mentor had the same problem with another burgundy. All this to say, this is a hard problem. It ain't you. That said, you did err by expecting two cans to come out the same. The problem is, there is "rounding error" on the tint shots. Computer controlled tinters are an attempt to solve it, but even that is not perfect. This problem is much worse on smaller cans because rounding error matters a lot more when the shot is 1/4 or 1/16 the size... so you greatly amplified the issue with 1/2 pint sampler cans. Yes, you must buy all your paint and "average the error" by mixing all the cans together. At that point sampler cans stop making sense. At least you are working in "latex" (emulsion) paint, which is basically nontoxic and not hard to dispose of. Lucky you! I took the cans back to the store and asked for advice. 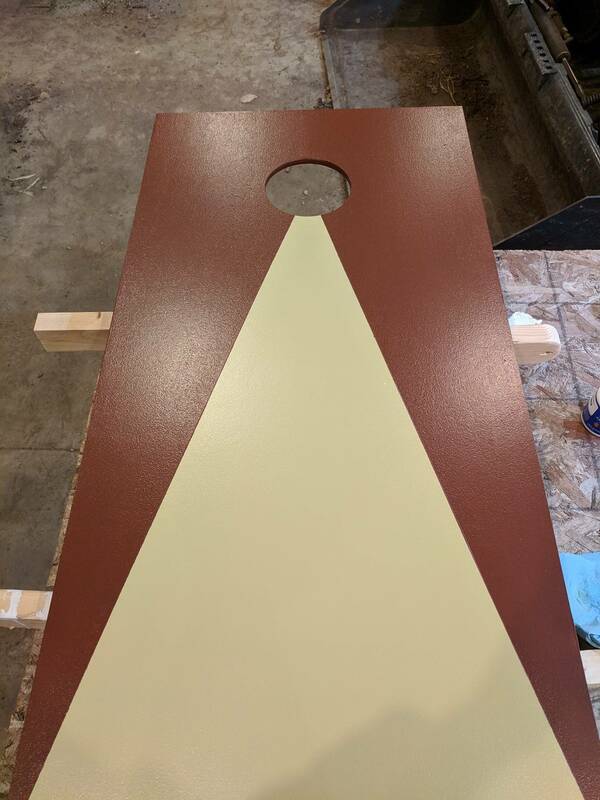 Turns out, the two different colors (gold & brown) used two different base colors (stain & deep base vs. satin ultra deep base). I didn't realize it when I purchased the original cans of paint, because I just asked them to match specific colors. When I purchased the 2nd set of cans, I only looked at one of the colors. I have to admit I feel pretty foolish. Not the answer you're looking for? Browse other questions tagged painting paint or ask your own question. Where can I find computer readable RGB values for brand name paints? Drywall Painting: Do I need to keep priming here? How to clean up spilled paint on carpet? How do you avoid brush strokes in satin finish when painting around casings? Is spinning a new paint can the same as mixing? Should I add Floetrol / XIM Latex Extender to my Exterior Acrylic Latex Paint? Trouble matching paint color - should I try again?